Curtains, the final collaboration of legendary John Kander and Fred Ebb (Rupert Holmes came in to finish the show after Ebb’s death), is finally taking a Bay Area bow. Diablo Theatre Company (formerly Diablo Light Opera Company) opens the show tonight (Feb. 12) at the Lesher Center for the Arts in Walnut Creek, where it runs through Feb. 28. A combination backstage musical meets murder mystery, Curtains won a Tony Award for its Broadway leading man, David Hyde Pierce, who played Lieutenant Frank Cioffi, a Boston homicide detective investigating the death of a musical theater diva. 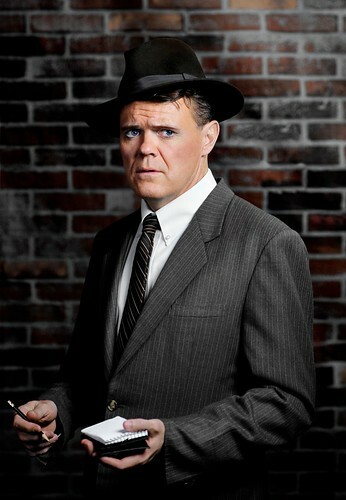 In the DTC production, Oakland’s Tom Reardon plays Cioffi, and that right-side-of-the-law sleuth isn’t too far removed from Reardon’s actual day job: he’s an Alameda County Superior Court judge. Reardon (right) has performed with a number of Bay Area companies, including Contra Costa Civic Theatre. He previously appeared in DTC productions of Peter Pan (he was Captain Hook in 2007), and last year he was Henry Higgins in the Lamplighters production of My Fair Lady. So how did the Hon. Tom Reardon make the leap to song-and-dance man? Former member of the Grammy-winning ensemble Chanticleer, Chad Runyon (left) is playing several roles in DTC’s Curtains. He’s conducting the orchestra and he’s playing Sasha, the Russian conductor for the show-within-the-show, Robin Hood. And he does it all without leaving the orchestra pit. Runyon, a Danville resident, spent 10 years exploring some of the greatest choral music ever written with Chanticleer. Since he left the group, he has continued recording and also teaches, conducts and has been vocal director for DTC since the company’s production of Thoroughly Modern Millie three years ago. For Curtains, Runyon has had to brush up his Russian accent. “Curtains” Trailer from Diablo Theatre Company on Vimeo. Diablo Theatre Company Diablo Theatre Company’s Curtains runs Feb. 12-28 at the Lesher Center for the Arts, 1601 Civic Drive, Walnut Creek. Tickets are $29 to $42. Call 925-943-7469 or visit www.lesherartscener.org or www.diablotheatre.org.